Line Punctuation is one of the most common forms of punctuation for old styles of poetry. If you flip through an old poetry book, you’re going to run across it, and most teachers show poems with line punctuation first in their classes. The value of line punctuation really breaks down to one thing, reading poetry. When a reader has line punctuation, they feel more at ease reading a poem if and only if they have a habit of stopping at the end of a line. Since poetry used to be all about that sound, ’bout that sound, ’bout that sound, not written, the end of the line usually was the end of a sentence, or where a period, exclamation point, comma, dash, or other type of punctuation was sitting. After all, when poetry was first transcribed and read in letter, it was meant to be read for those who were still illiterate for a long time afterwards. It wasn’t common to read poems in print, therefor the language had to be geared towards shorter lines with obvious beat and punctuation that assisted the reader to get it right each and every time, and the same each and every time. Rhyming also has some support with line punctuation because the natural meter that line punctuation can provide, can help hide or stretch some of the rhymes that are weaker than others. Using line punctuation cannot make words like word and fear rhyme, but word and chard, yeah, it might hide that if you’re good. Carve pardon for my hardyhedde. For thy thereof thou takest shame. And I will send more after thee. As you can see, the poem is before the time when words were spelled like they are today. This is back around/before Shakespeare, and it has two lines that do not have punctuation at the end. “To him that is the president” and “As sure it will, for succoure flee” both lack a punctuation mark at the end! This was during the time when punctuation at the end of a line was at it’s height, and the majority of his poems have the cadence that support punctuation falling at the end. So what can this tell us today? Well, that it’s not necessary even when using an older style to maintain strictly to having punctuation at the end of literally every line. There’s more to it than that. What line punctuation is good for is when you’re writing a poem with a certain meter [cadence] and you want to ensure that meter is being met. That means the writer is using those punctuation marks more like breath punctuation, or to follow the inflection of the poem, rather than just because it’s the end of a line. Traditionally, meter ends at the end of the line with a strong or soft beat that feels like the end of the pattern, and therefore it ends up with end punctuation. This is when it’s typically supported the most by how the poem is read. If a poem doesn’t read with a meter, chances are it won’t look good, or sound good, with line punctuation. It can seem like a really old style for a poem. The problem with using line punctuation might seem obvious to some of you by this point, especially those of you who are familiar with it from personal experience, but let me lay out how I’ve responded as a reader to line punctuation. I want to drown in the sea! And being someone who handles a lot of unpracticed poets, I am stuck trying to explain why it doesn’t have any emotion when they’re talking about suicide. So where do I begin? Personally, I start with structure because these lines are not beefy and that’s a big part of the problem. Taking away the line punctuation doesn’t help this poem, by any means, but, after seeing a lot of poems like this, and writing a lot of them myself when I was at that delicate age of hating the world, I grew out of love with line punctuation. So the first thing I check whenever I read the poem as a critiquer is line punctuation and capitalization. If those two things are there, chances are, I’m not going to like this poem as much. If the poem shows promise after I get by the first two lines, I try to struggle away my general dislike from years of handling poorly written line punctuated and capitalized poems, but it can be a struggle. When I did Submission Reading for literary magazines, and when I do contests, these two things are top on the list of annoying things for most readers I was speaking to. Just to stand out, staying away from these two things can be a good idea. The third top thing was rhyming in poems. That being said, don’t let it compromise your poem if the poem feels best with this formal style. Just know what battleground you’re entering if you want to submit it. I am a strong advocate for using anything and everything in your arsenal, so line punctuation is no different. The question should never be ‘should’, but ‘when’ because it has it’s time and place. For instance, if you were writing a haiku, probably not the best time to use line punctuation. Haiku aren’t a style that benefit from the added structure because they started out with their own structure and rely on a couplet, and a turn. However, if you are writing a villanelle, or a cinquain, or some other form of poetry that either requires meter and/or rhyme, using end punctuation and enjambment can create a completely new and unique atmosphere for an old style of poetry, or an older feeling to make it seem dated and antique. The best thing for you to do as a poet is to experiment and read. The more you read, the more you’ll discover what touches your funny bone, kicks you in the shin, or gives you a back massage after a long day’s work. In other words, you’ll find what you like and what you don’t like. If you avoid writing the types of poems you don’t like, you’ll find an audience who likes what you like too. After all, we’re a bit of a niche right now. Most people who read poetry are those who write it, so if you, as a writer, don’t like something, chances are your audience doesn’t either. 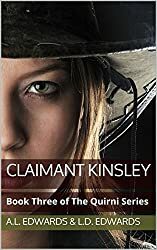 If you enjoyed reading about line punctuation, check out Quirni on Amazon Kindle to see how I utilize my poetic language in a full on science fiction adventure! Join Erica as she explores a whole new world in Book One and help support my blogging hobby by buying a copy. Have a question? Write a comment! I would love to hear from each and every one of you about your experiences with poetry, writing, fiction, or anything else on this blog! If you don’t find somewhere you feel comfortable commenting, leave it on my “About” page and I’ll get to it ASAP! Thanks so much for reading, and stay subscribed for new updates! Non-capitalization is good for helping progress the emotional drama of a poem. For many poems, this is a capitalization strategy that you can try to see if it will help improve what you want to say. This style can surprise you. Writing any poem without capitalization to begin with can be a challenge, so mostly this style is good after finishing a poem while exploring all of the different tones and options. The time I find non-capitalization helpful in a poem is when the poem is informal, and quiet, or morose. Non-capitalization tends to change the tone towards something more personal and sincere. Poems which are navel gazers or preaching poems can turn into something that sounds honest when getting rid of the formality of grammar. There are two different ways that you can play with non-capitalization; leave everything uncapitalized, and leave sentences uncapitalized. The difference is a method of thought. In most cases, uncapitalized poetry won’t mean uncapitalized words, just not capitalizing the first word in your sentences, but that isn’t the only grammar rule which deals with capitalization. Some poets also add on that they want to capitalize nothing. It’s all about a degree of choice. There are even some poets who will choose to capitalize nothing but the most important part of the poem to draw attention to it. This tone is usually more private, almost like whispering and sharing a secret. It comes off soft, and sometimes disrespectful to the speaker or the individuals and places involved. This is because most of the time capitalization of proper nouns and pronouns is regarded as honoring that individual. With this style, you would not capitalize things like “I” and “United States” which can leave the tone of the poem somewhat morose. Most poems that choose to go with this style also feel less restricted to proper sentence structure and grammatical rules. There is a new trend in poetry for younger generations which creates poems that do not follow these grammatical rules such as just using lists of noun phrases as a poem rather than adding verbs and sentences. These poems can be very bold and shocking, but most of them will look better without capitalization because it plays at the idea that these are not sentences, but fragments which were meant to be fragments. The more you want to break traditional rules, the less grammar and punctuation you may want to try in the poem. Not all poems will abide by these rules. It takes understanding the subject, the motivation, and the response people will have to find a balance between clarity, and presentation. Some grammar rules will help with the flow of the poem. This tone presents with more belief in self if the poem is first person, and more respect for the character if it is in third person. In this case, you still capitalize things like “I” and “Tim” but you wouldn’t capitalize the beginning of sentences. Oftentimes this is the stop-gap for poems which feel too formal with capitalization, but not informal enough for a lack of capitalization. Another fun thing to do with this style of non-capitalization is to allow for a lack of punctuation, or minimal punctuation which can create interesting sentences, and develop new ways to read lines. You can use enjambment to plan sentences as they read, versus sentences that are on a line. This can be tricky if you stick with all grammar rules, but given the trends of poems, it’s oftentimes easier to create unique images on a line with enjambment than you may imagine. In many ways non-capitalization in poetry can be a challenge to see how well your poem stands up to grammatical criticism as we read. Sometimes the capitalization in a sentence or paragraph can hide grammatical flaws like missing clauses. As we read, we jump from sentence to sentence with capitalization guiding us along, and getting rid of that capitalization can create a new perspective of how the sentences flow together, and where they don’t. A problem for some young writers is to write in complete sentences, and getting rid of capitalization can show them where the complete sentences are so they stop putting periods where a comma should go. More than a learning tool, taking away capitalization can give people a feeling of missing something which may be exactly what your poem is about. Sometimes the best metaphors for emotions are visual rather than the symbolic meanings of the words. If the poem is about a lack of beginnings, or a lack of respect, or just written by someone who would be texting it rather than typing, try taking out capitalization, give it a little bit of time, then read it fresh and see if you like it better. The worst thing that could happen is having to add the capitalization back in, so it’s worth the extra effort! I have devised a list of a few things you should and should not do if you want to get your poem into the right pile. I’m sure you’ll have read lists like this over and over, but hey, it never hurts to have another list. And I’m all fired up from editing so I might as well share. This is is a good thing to check out for some advice. So you think you can Syllable? Syllable counting is one of those things that poets are supposed to know how to do. Why? Well there are a lot of reasons. Having the same amount of syllables in multiple lines can help the flow of the lines and provide a reader with expectations for how long the next lines are going to be giving us a chance for surprise. The reason we can’t just do this with length is because syllables often vary in length on the page. For instance, “strength” is a single syllable. The methods we usually have for learning this are pretty straightforward for some of the population that is more hearing-oriented, but no matter who you are, you can learn to identify syllables. You don’t have to be able to hear them. That being said, the other methods of learning them, listed below, are somewhat complex ideas, so I need to over some basics first. Linguistics is the study of language in general. It’s a descriptive study of language, meaning linguistics attempts to describe what is already going on in language, not create rules for people to follow as a whole. They have a way to think about syllables which I can pretty much guarantee, you’ve never run into before. It’s good stuff. In Linguistics, there is an International Phonetic Alphabet which linguists use to indicate sounds without catering to a specific language. This IPA is used to indicate the difference between things like a hard I and a soft I or the difference between th and t, or z, and s. It’s broken up into sections according to where the sound is made, and covers all possible sounds humans as a species could conceivably make with the equipment we’re provided. After that, I have a more prescriptive way outlined for those of us who just want to get right to the rules of what to do. This won’t always work however, because language is fluid. However, it will give you a place to start. To start, I’m going to re-explain what you’ve probably already been frustrated with about how to count syllables and then we’ll move into the linguistics, then the rules. How do we hear that? Strength-en is because we can hear the minute language change sort of like a pecking sound in the word. For instance, “pecking” has “peck” and “ing” however, it’s not always apparent where the language is split. “Apparent” is a three syllable word that can be hard to determine. “A-par-ent” is usually the way that it’s broken up, however, it’s potentially going to change for your own dialect and pronunciation. For those of us less linguistically inclined, but still wanting to get this without rules, think about it like breaking up words into their base. From there, you’re going to have to decide if those parts sound like they’re separated at all or not. As long as you can get how many syllables a word has, it doesn’t really matter if you can break it up appropriately, so don’t fret so much about the were, so much as the how many. So I actually did a bit of research to see how better to describe this to people who just aren’t getting the first method. Here’s what I’ve found: This is actually a result of how language is created. Syllables are parts of words that are stuffed together to make the complete idea. It’s sort of like when you have a card, you have the number/face and the color/suit, and then the individual suits in those colors. We can’t have individual cards with just 1-24 because that wouldn’t be much fun matching pairs, there wouldn’t be any! We create classifications so we don’t have to memorize so much and some of those groupings for words are syllables. A large part of structured poetry is based on your ability to count syllables. To get going, first, a syllable is a part of words. Each word is composed of syllables in any language. In every language, we compose our words with syllables which tend to follow similar patterns. When we learn about syllables in school, they say to listen to what you’re saying, and group it according to breaks in language. This is because as we grow up, we start speaking by learning syllables. When babies engage in babble, they are actually practicing forming syllables. “Ba” for instance, is a syllable, same with “da” and “ga” and so on. As it is how we learned to speak in the first place, we often can already identify syllables, by accessing our intuition. If you are not among those who can easily identify syllables, don’t worry! Linguistics has studied syllables and come up with ways to identify syllables in your language, whatever that might be. A syllable is a part of speech, sure, but what is it made of? The quick answer is a vowel and consonants. Linguistics have called these parts the nucleus, onset, and coda. In other words, a syllable is composed of up to three sounds, the main sound, the sound before that sound, and the sound after it. Syllables contain multiple parts because they’re bigger than just letters. One part of every syllable is the loudest/longest part, similar to the nucleus in an atom. Linguistics calls this the nucleus of a syllable. A hard fast rule you can cling to is that vowels can always make up the nucleus in syllables, always. However, other things can be the nucleus too, though not much. The nucleus of a syllable is what is holding the sounds together. So when the sound is being held together, it needs a sound in the middle which has good air flow, such as mm, nn, or even rr, which makes up the center noise. Quieter noises, like those which aren’t vocalized, often can’t hold up to that weight, they’re sounds which circle noises which are stronger and louder. When we’re looking to count syllables, we can immediately break away any vowels that are next to one another and not composing a single sound. For instance, if we’re looking at the following list of words, we can tell how many syllables they have by just counting the vowels. As you can see, there are different exceptions to these rules, but they’re not so much exceptions, as looking at the word phonetically. Think about “foxy” phonetically, as it sounds. The word starts with a “ff”, then goes into “ah” “x” and “ee” at the end. This makes two vowel noises rather than just one. Same with barbeque, we don’t hear the “e” on the end, because in English, it is silent. That means the noise isn’t phonetically marked, and thus, is not a part of its own syllable. Trepidation is harder. I put it on the list because “ion” is not “ee” and “aw” “nn” it’s closer to the word “in” or “on” depending on your accent. This is only one noise. As “ion” is a common suffix on words, it is always something that can be used as a syllable, usually with the attached onset of whatever consonant comes before it. Basically, the nucleus is the noise which is the longest and loudest in the syllable. A nucleus is always made when there is a vowel sound. Vowels are a clear hallmark of a nucleus. In some cases, like “mountain” the phonetic noise of “tn” at the end won’t have a vowel though, and in these cases, noises which are long, and have moderate to good air flow such as “mm” and “nn” which are nasal vocalized sounds, can act as the nucleus instead of a vowel. Around the nucleus are two different sections, the onset, which is the more important of the two, and the coda. The onset is whatever sound leads up to the nucleus of a sound, and the coda leads away from it. Both of these are completely optional, sort of like in sentences how subjects and predicates are up in the air, but you have to have a word. “Go.” is a perfectly valid sentence because of an implied subject. For syllables, the vowels can always be a syllable alone, but they can also have some clothes on, the onset and coda. An onset is an optional part of a syllable, but between a coda and an onset, the onset is more likely to happen than the coda. This is because it is easier for us to hear/collect/recognize information coming before a nucleus than after it. Language is about communicating, so being able to identify what we hear is important. Because the nucleus is strong, it is easier to miss the end sounds, codas, than it is to miss sounds before it, onsets. An onset will be any consonant sound. This could be anything like “th” all the way to “z” so they’re fairly important. Basically, any consonant noises before a nucleus can be an onset to that nucleus, however, it cannot be another nucleus. These are how we identify where to break up the actual syllables in our words. Let’s go back to our list and examine the onsets we have there. All of the underlined letters are potential onsets to the bolded nucleus. In “ginger” we have “[g]i[ng]er” for instance. In this case, there’s some examining to do. Because we’ve got both n and g with the second onset, we have to determine if it is a viable word. Every syllable should be able to start a word. So, can “nge” start a word? Can you think of any words which start with “nge?” Personally I can’t, so because I cannot think of words which start with “nge” I know that the n has to be the coda, and the g has to be the onset alone. This is how you figure out syllables. Every word you meet, determine the vowels which are actually heard when you say the word, then, determine the consonants surrounding those vowels. If you have more than one consonant before a vowel/nucleus, ask if it can start a word. If it can, then both/all noises are part of the onset, and if not, then that is where you divide the syllable. Let’s do the rest of the list. Our next word is (f)o(x)y. This one is pretty quick because we only have two vowels and two onsets. Regardless of whether we break it up “fox-ee” or “fo-xy” we end up with two syllables. Personally I’ve never heard of a word that starts with Xy though, so I like “Fox-y” as the division. The third word on our list is (b)a(rb)e(q)ue, we have three syllables here because we have three vowels. There’s nothing tricky at the end to make another vowel. Here, we see a clear use of codas again for that middle potential onsets. I don’t know of a word that starts with the syllable “Rbe” but “bar” is definitely a word, so I’m going to break this down into it’s parts of the word. “bar-be-que” because a “cue” ball sounds exactly like “que” anyways, also “be” is totally a word. Lastly, (tr)e(p)i(d)a(t)ion. In this word, we actually have a consonant set that actually does start a word, and is together, but we also have tree, trim, trailer, and so forth as examples of “tr” starting words in English. As for the rest, it’s a break right before the consonant because the vowels like to be onsets rather than codas. To explain why they like to be onsets more than codas, I have to go into explaining codas, so here we go. If you don’t care to learn about codas and you’re just happy to know that you can break up vowels as they are, then go ahead and stop reading here, or skip down. Codas are the ending sounds of a syllable because they are the sounds that come after the strong words. Basically, they’re the tail. Just like we can have prefixes, we can have suffixes in syllables too. In this case, these suffixes, or endings, are actually used as a sort of cap and are a part of the rhyme pair when rhyming. All in all, because we find it easier to hear onsets rather than codas, just like we want the subject front and center, or our favorite dish first so we have fresh taste buds, we are more inclined to have onsets than codas. Anything can be a coda in language, however, we are more disposed to hearing them as onsets. Think about it like seeing a pattern. You don’t look at a pattern like /-/-/-/- and break it up by saying Oh, every (-) is the end, so every (/) must be the beginning. We look at the first thing that’s there, and break it up because a (/) is next. /- /- /- /- that way when we end up with /-.- /-.- /-.- we don’t mess up. In many ways, this is exactly how we break up syllables too. Instead of looking for codas, look for the nucleus and then any onsets. The codas, however, are good for rhyming. The part of a word that sounds like a rhyme is actually the nucleus and the coda. This is because the coda alters the ending sound of the nucleus giving us more options for language. When we label something for a rhyme, the onsets don’t actually matter so much as the vowel and coda. Slant rhyme is rhyming just the vowel sound because of that very fact. Treat rhymes with feet because “eet” is the same in both of them, even though “f” and “tr” are different, and both are only a single syllable. For rhyming purposes, codas are important, but in terms of identifying syllables, not so much. So what are we actually doing when we listen for syllables? We’re identifying the difference between a coda and an onset through our intuitive knowledge of how language works. Just like we don’t need to know that a verb needs a direct object because of a list that says what verbs require them, we often don’t need someone telling us that two specific consonants don’t get stuffed together to start a noise. On top of that, when we use prefixes and suffixes, we are adding a complete syllable because we’re adding a noise, a full noise, to a pre-established word. This can get confusing with words like “words” because s is a suffix, but it’s not strong enough to stand on its own as a nucleus, so it’s stuffed on to the rest of the word and is left as a single syllable. I’m going to go over them for a complex word and see how the two compare. Root words themselves already have syllables, so put the word back down to it’s root. This is helpful with words like disestablishmentarianism. All of our prefixes and suffixes are as follows. dis-establish-ment-arian-ism. From what we learned earlier, we can break it apart with our nuclei too. Here are our potential onsets and why they are or are not onsets. sta = star, stairs, etc. shme= shmuck is u not e, so no. di-se-stab-lish-men-ta-ri-an-ism = 9 syllables. Above, breaking away the prefixes, we have five of these nine. Personally, this is how I break up this word: dis-e-stab-lish-ment-ar-i-an-ism, which is still nine syllables. They only differ in “dis” and “ment” but that doesn’t change the syllable count. The next step for rules of what to break and where helps us get closer to accurate. There is a caveat to this, Don’t separate consonants that are making a single sound such as sh, and th. Howwever, repeated consonants such as in little, break those apart. Let’s go back to our suffix/prefix split word above and add this rule. Did you notice a difference? The ism is broken up because m is able to hold the weight of a nucleus in a word. If you just look at vowels as a nucleus, you don’t notice “mm” and “nn” which are trying to hold that weight. Now we’re up to 7 out of what should be 10 syllables. We actually have so few vowels in this that this rule only applies in one case “ari” and in this case, we have a hard/long “I”, so we divide after the “I.” Now we’re at 8 out of 10! Basically we’re supposed to look at “le” endings now, but our word actually doesn’t have that. For this, they want us to divide after the k but before the l, so ck-le. After “ckle” they want us to look for “le” at the end and see if the letter before “le” is a vowel. If it is, then leave it attached, if it’s not, pull it off with the consonant. That means this method falls short, but how? The simple answer: they didn’t count on a nucleus without an onset or coda. Here’s another rule you can add that should put you up to the right count. – Pair consonants at the front of vowels if the resulting group starts a word. – If a vowel has vowels on either side, separate into its own syllable. And we got to 10! Depending on how you pronounce “ism” it may be 9 or 10. When you’re using the other method, remember to check the end of your words and determine if mm or nn is the last sound. Chances are, the few times you run into this situation, you can use a syllable counter to determine what the standard norm for that word is anyway, and you won’t have an issue counting the syllables. Please remember, syllable counters are computers trying to determine human language. They’re not always right! Oftentimes they don’t understand things like silent e and that messes up their counts. In short, listen to how you speak and break it up according to when you hear changes in tone, with vowels and consonants together. If it has a short vowel, chances are it needs more consents. If it has a long vowel, it needs fewer consonants. Of all the different ways that Poetry is written, one of the most obvious grammatical markers is capitalization. In the following article I’ll go over the many types of capitalization briefly, and later add more in-depth thoughts on each style. There are multiple ways to work with capitalization in poetry. For our sake, I will call them Line Capitalization, Sentence Capitalization, Alternative Capitalization, and Non-Capitalization. This article will just have the generalized types due to the length the article would need to be in order to go over the specifics for all of them. But was encased in glass. Between us, separating our love. Native Earth, calling me home. This is one of the most popular capitalization styles in general. It’s used widely through publication still today, and started in publication much older than we care to read. It’s not the be-all end-all that it likes to make itself out to be however. In many ways, this type of capitalization can feel stodgy and old due to how old the style actually is. Line Capitalization is good for the old-style, nursery rhymed poems, but it meets its match when it comes to appealing to an audience which is experienced in other versions of capitalization. Simply put, this style interrupts the eye flow of the reader by suggesting there is a new sentence every line. For a reader who reads through the lines, as people are trained to read poetry, it can break up the flow of reading and thus, is less prefered than otherwise. Of the many types of capitalization, this is the most widely accepted today. If you pick up anthologies, this is probably the type of capitalization that you will see. This is because it is most grammatically familiar to us. Having something familiar allows us to hold onto what we already recognize as sentence and paragraph structures, and introduce us to something new, poetry stanzas. We don’t have to think so hard to read it because we’re not fighting against capitalization telling us that there is a new sentence, and we don’t have to think so hard to read through the lines. This transitions us through the poem by providing familiar guidelines, rather than making a poem look so foreign. Even among those poems which rhyme, this is more popular because it doesn’t interrupt the flow of the poem as the reader follows the capitalization indicators for tone since it’s larger than a period, and easier to see. Of the many ways of capitalization, this is the most common because it agrees with our natural sense of grammar. to ask you for my sun. so clean, and i am not. nothing but a dead rock. And others such as capitalization for beat, and so forth. Some of the advantages of this type of capitalization is to give us the ability to share fluctuation as we do in chat, and in discussions without intense use of punctuation. As CAPITALS is considered YELLING today on the internet, we can use THAT to our advantage and provide an inflection or SYNcoPAtion for those who are going to be reading on a stage. Performing poets who publish their manuscripts from their performances often do this type of capitalization to provide a more original sense of the work. However, it is not that common among people who aren’t familiar with reading it. On top of that, with brief promiscuities to a standard grammatical format such as when a writer chooses to not capitalize certain words that are supposed to be capitalized in standard grammar, and that is the only alteration to their standard grammatical structure, it is often considered ungrammatical rather than author’s discretion. It’s sort of like coming to Christmas Dinner with your pants on backwards., or eating with your mouth open. It’s considered “wrong” before they wonder if it was on purpose. and dream among the clouds. is all i hope to keep. This type of poem often is just attempting to be gentle, or quiet, or informal, rather than being obstinate or unruly. Oftentimes, the same poem with the same capitalization can feel less personal, less like a plea, and provide the reader with a more self-assured tone. Either that, or a formal tone. At the same time, a poem about getting rid of conformities could sarcastically use perfect grammar and therefor capitalization, or imperfect grammar just using punctuation, and no capitalization. This mix allows the reader to develop their own sense of identity within the poem, and a new perspective. This is one of the most up-and-coming types of poetry as well. Many young writers see this, and after getting over the shock of it lacking capitalization, learn to develop and love this style as it fits with the texting habits of their generation, and feels less formal because it’s not using school-house grammar so sternly. The different types of capitalizations are often used for different types of poems. While writing poetry, it is encouraged to explore all sorts of grammatical options, such as unique capitalizations, and different styles of punctuation in order to find the best fit for your poem. While the capitalization of a poem might not look like it matters much, in reality, the capitalization actually provides the backbone of the emotional feel of a poem. To get the full effect of a poem, it should go through a stage where capitalizations are changed in order to determine what type of effect the poem’s language best connotes with. Poetry is an art, and art is as much about composition as it is the things composed with. The way a poem lays on a page, and looks on a page matters as much as what is said. An overlooked feature of poetry on the internet today is the immediate sense of feel that a poem provides. We, as readers, can identify when a paragraph is too long or too short just by the length and size of the paragraph. One of our baser instincts of editing, even without knowing the language, is the size a paragraph should be. Similarly, we can tell certain things about a poem by looking at them. One of the markers we use to understand the style of poem is capitalization, so it is important not to overlook this detail when writing a poem. Take my first two examples for instance; both of them have the same words. If you actually read the words, you picked up on that, but if you just read those words that have capitalization, you glanced around the second poem more than the first. Your eye traveled differently across the poem as you saw the capitalization, and that was on purpose. I used enjambment to create a poem with more inward, better movement than with Line Capitalization. This doesn’t matter much. The poem is still the same both ways, but it allows you to see the differences between the two styles and hopefully, explore them on some of your own peoms.